March 2nd: With the arrival of March and the end to the “tagging” limitations on teams, the Anaheim Ducks have made their extension of Silfverberg official. As expected, it is a five-year deal through the 2023-24 season, the team announced. CapFriendly adds that the contract is worth a total of $26.25MM, evenly distributed in salary across the five seasons for an AAV of $5.25MM, as initially suggested by Sportsnet’s Elliotte Friedman. CapFriendly also reports that the contract has limited trade protection in the form of a 12-team no-trade list that lasts through the end of the deal. Following the deadline trade of defenseman Brandon Montour and now the official signing of Silfverberg, the Ducks are committed to approximately $73.63MM in salary for 17 non-waiver eligible players next season. Anaheim will have their work cut out for them in filling out the remaining six spots on the roster for next season while working under a salary cap expected to land around $82MM. 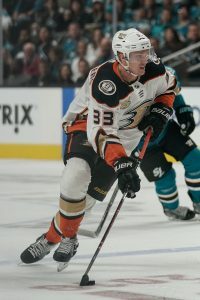 February 20th: The Ducks and winger Jakob Silfverberg are in agreement in principle on a five-year contract extension, Pierre LeBrun of TSN and The Athletic reports (subscription required). That said, don’t expect an announcement to be done right away as Anaheim is still dealing with tagging issues. Teams get a 10% increase in their tagging room on March 1st and they will use that wiggle room in order to get the deal done so the deal won’t be made official for another week and a half. Silfverberg is currently making $3.75MM and is set to earn a nice raise as the new deal will carry an AAV of slightly over $5MM per season with a ten-team no-trade clause, per Eric Stephens and Josh Cooper, also of The Athletic. Sportsnet’s Elliotte Friedman pegs (Twitter link) the cap hit to come in around $5.25MM. While his point total is down this season, he actually is on pace for a career high in goals and he has long been viewed as a quality two-way player. An AAV of roughly $5MM is in line with what quality second-line wingers are getting and he’ll only be 33 at the end of the deal so there shouldn’t be too much concern about him slowing down significantly. However, this contract only exacerbates Anaheim’s salary cap concerns beyond this season. While the Upper Limit is expected to go up by a few million, it doesn’t appear as if they’ll have enough to fill out the rest of their roster and remain in cap compliance for next season. With that in mind, expect GM Bob Murray to try to push to clear out some contracts for next season as the top priority for the summer. They tried to make a move to help in that regard by placing winger Patrick Eaves on waivers (who has a $3.15MM cap hit) but he passed through unclaimed. All of a sudden, he looks like a potential buyout candidate this summer which would free up $2MM in cap space for next year (but add $1MM to the books in 2020-21). Dating back to last summer, Murray stated his preference was to get Silfverberg locked up. This has been accomplished, but there is still plenty of work to be done to get this team cap compliant for 2019-20. Red Wings winger Thomas Vanek is no stranger to being moved at the trade deadline. It’s undoubtedly part of the reason he pushed for a no-trade clause last summer in free agency and he managed to get one. Although Detroit is believed to be selling between now and the February 25th trade deadline, Helene St. James of the Detroit Free Press suggests that it’s unlikely that Vanek will be moved as he’s valued as a leader in the dressing room. For his part, the 35-year-old indicated that thought of waiving his no-trade clause simply hasn’t crossed his mind. Vanek has 23 points in 42 games so far this season. Golden Knights winger William Carrier has missed the last three weeks with what had been called an illness. Today, GM George McPhee informed reporters including Jesse Granger of The Athletic (Twitter link) that it’s actually an injury that’s keeping him out of the lineup although he declined to provide further specifics or an idea of how much longer he’ll be out. Despite missing seven games already, Carrier remains the league leader in hits by a significant margin and is averaging just under five per game. Ducks winger Corey Perry returned to practice for the first time since suffering a knee injury during the preseason, notes Elliott Teaford of the Orange County Register. While there is no timetable for his return, head coach Randy Carlyle indicated that he believes Perry is a little ahead of schedule. When he underwent surgery late in September, Anaheim announced that he was likely to be out until early March so that would suggest he’s a few weeks away from returning. In the same column, Teaford adds that the Ducks received permission to extend Patrick Eaves’ AHL conditioning stint by two more games. He’s on a Bona Fide Long-Term Injury/Illness Exception Conditioning Loan which is only supposed to last three games or six days, whichever comes first. Eaves has been out of the lineup since mid-November due to a fractured rib and has played in just five NHL games so far this season as well as the past three with AHL San Diego.